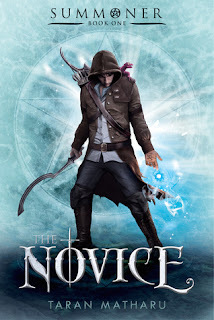 The Novice is a debut YA-fantasy novel by author Taran Matharu. It's a fun, easy and unique read that has simultaneously clearly been influenced by Harry Potter and Lord of the Rings - haven't we all?! In fact, I'd add His Dark Materials to the mix, because there are demons here that reminded me of the daemons Lira and her friends had in that series as well. In The Novice, we meet Fletcher, an orphaned peasant boy who lives very un-magically in a small village as a blacksmith's apprentice. That is, until he summons a Salamander demon by chance, almost gets killed by the village bully, has to go on the run and leave the life he's always know, and ends up recruited, along with his demon into a magical school. There, he will begin training along with other humans, dwarves and even elves, in the hopes of becoming a magical soldier and help fight a war against Orcs. (!!) All of the elements of this fantasy world are familiar on their own, but Taran Matharu does a good job of putting them together in a unique way without overtly imitating the source material. Character-wise, The Novice has a nice variety of your familiar tropes, and some new ones thrown in for good measure. As the main character, Fletcher was very likeable and engaging, despite being a bit run-of-the-mill. He's your standard good-guy character, who faces adversity left and right but you're always rooting for him, no matter what. I liked his origin story a lot but I don't feel like I got to know him as much as I would have liked. Granted it is the first book in the series, so there's still plenty of time to expand on his character. I appreciated that, once Fletcher got to the Academy, he wasn't instantly gifted in his Battlemage training. Despite his natural skill with a blade, and his clever mind, he struggled quite a bit with certain aspects of magic. It made his entire experience at the Academy much more real to me. It isn't long before Fletcher befriends other students at the Academy, including other commoners, a dwarf and a female elf. I liked that Fletcher was so willing to befriend different magical beings, it reminded me of Harry Potter and his willingness to value the lives of goblins and house elves equally to wizards. A standout among Fletcher's new friends was Othello, the dwarf. I liked his easy friendship with Fletcher and how they had each other's back no matter what. As a matter of fact, the dwarves as a whole were an aspect I can't wait to learn more about here. Sylva the Elf was another character that I would like to know more about, especially her people since we don't really get to know her people. As far as the teachers at the Academy, I liked Valens and Arcturus but neither one got nearly enough page-time in my opinion. Hopefully in future books, they'll get the attention they deserve. On the villain side of things, I was a little less impressed. Within his first days at school, Fletcher encounters two nobles, a twin boy and girl and instantly sparks fly. Tarquin and Isadora are the equivalent of Draco Malfoy - if Draco had an equally vile twin sister O.O And then there's a substitute teacher who shows up named Rook, who has an affinity for the nobility, especially the twins I just mentioned, and who is unfairly harsh on Fletcher. Sounds a little too familiar doesn't it? There was talk of Inquisitors that sounded quite sinister and a King who sounds a bit like a tyrant but the story doesn't make its way to them just yet. I'm definitely curious to know more on both counts! Despite the lackluster bad-guys, the only other issue I had with The Novice was the pacing - it felt off at times. We spent a lot of time with Fletcher before he gets to The Academy, but once he's there, the story would randomly jump ahead from time to time, sometimes months were skimmed over and even though nothing might have happened, the jumps were somewhat offputting. I would have liked to spend more time in the day-in, day-out routine at the Academy to get a better feel of how life was for Fletcher and the other students. Similarly, the ending had all the action that was going down felt rushed for some reason. It wasn't that I wished the actual battles would have dragged on, but it seemed like they were training for the event for ever and then, in a blink it was over. Minor issues aside, The Novice was and enjoyable story that kept me turning the pages until the very end. I'll definitely be continuing with the series and I look forward to delving deeper into this world! Fantasy readers of all age ranges should check this one out. I've heard a lot of similar things about this one and idk if I want to read it! On one hand it sounds like it would be so much fun but then again, it seems to be drawing on a lot of elements from very well loved books and that puts me off. I am glad though that in spite of some of your issues, you managed to like the book! Well I'm curious to see how the subsequent books get reviewed and if they are well received then I'll think about adding this to my tbr. Such blatant comparisons to HP irritate me big time so I'm not convinced I could get by that... but other than a few issues, I can definitely see the potential here from your review so hopefully the sequels will keep improving!